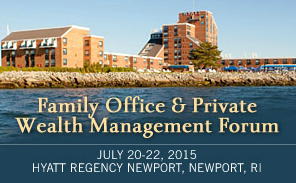 Aliso Viejo, CA, July 15, 2015	(Newswire.com) - 1031 CrowdFunding LLC announced today that its Founder and CEO, Edward Fernandez, and Chief Investment Officer, William Erickson, will sponsor, attend, and present at the Opal Financial Group’s Family Office and Private Wealth Management Forum in Newport, RI, on July 20-22, 2015. Fernandez will participate on Tuesday’s Crowdfunding panel, discussing the pros and cons, regulatory issues, and costs of crowdfunding. The discussion will be moderated by the General Counsel from The Strategic Group of Companies. Other panelists will include representatives from iFunding, Alpha Venture Partners/Pritzker Group Venture Capital, and Funding Circle. This is Opal Financial Group's flagship event and one of the largest family office conferences in the world. The event boasts over 1000 attendees, with more than 500 representatives from family offices from North America and around the world. The event’s keynote speakers are Walter O'Brien, CEO of Conviergeup.com, which is powered by Scopioncomputerservices.com, and the Executive Producer of the show Scorpion on CBS.